Manager Jose Mourinho is among three Chelsea staff charged by the Football Association following the club's Premier League loss to Sunderland. 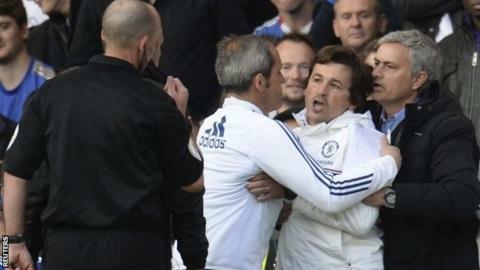 Assistant manager Rui Faria and midfielder Ramires have also been charged following the 2-1 defeat. Mourinho is charged with misconduct following comments he made after the match at Stamford Bridge. Ramires has been charged with violent conduct, while Faria has been charged with two counts of misconduct. Mourinho refused to take questions after the defeat to bottom club Sunderland, which ended his unbeaten Premier League home record as Chelsea manager. However, he congratulated both referee Mike Dean for his performance, which he described as "unbelievable", and Mike Riley, head of refereeing body Professional Game Match Officials Limited, in a television interview. The FA alleges that his comments call into question the integrity of Dean and/or Riley and/or bring the game into disrepute. Mourinho has until 18:00 BST on Monday to respond to the charge. Brazilian midfielder Ramires, 27, has been charged following an off-the-ball incident with Sunderland's Sebastian Larsson, which was not seen by the match officials but which was reviewed by a panel of former referees. He has until 18:00 on Thursday to respond to the charge. Faria's two charges follow an allegation that he used abusive and/or insulting words towards the fourth official and that his behaviour after being ordered to leave the technical area amounted to improper conduct. Faria, who had to be restrained from confronting Dean after Sunderland had been awarded what turned out to the match-winning penalty, has until 18:00 on Monday to respond to the charge.